The challenge has been created to link the power of the show’s audience ‘walking to unite the world through technology’. The official electronica app, which can be downloaded to a mobile phone or smart device, will be used to count the entire number of steps taken by everyone visiting across the four days of the event. The purpose is to walk the distance from each country’s capital to the fair in Munich: it will take 436,000,000 steps to reach this ambitious target. As each 100,000,000 milestone is accomplished, the organisers will donate FIRST LEGO League kits to community groups across Germany. This will allow teams of six to 16-year olds to become engaged in the league who would not otherwise have the means to do so. 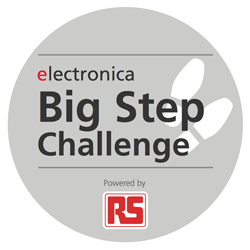 To take part, visitors are asked to download the app and sign up to the Big Step Challenge. The app can be downloaded from all main app stores: search electronica 2018.